When Christian Bale made a few snide comments about Moses recently, calling the prophet "schizophrenic" and "barbaric", many presumed that Ridley Scott's latest movie, Exodus: Gods and Kings, would be inaccurate in many places. Of course, history and religion are open to interpretation, so if Scott does take a few creative liberties with the retelling of the famous story, then it is his right as a filmmaker to do so. After all, he has the formidable The Ten Commandments (Cecil B. DeMille, 1956) to beat. The story begins with the Egyptian Pharoah Seti I (John Turturro) planning war against the Hitittes. The year is 1300 BCE, and Seti I puts his son, Rameses II (Joel Edgerton), and his adopted nephew, Moses (Christian Bale), in charge of the operation. The High Priestess (Indira Varma) reads the entrails of a bird to predict the future, but she does not see the outcome of the war. All she sees is that one of them will be saved, and the saviour will go on to become a leader who will probably cause the other harm. Rameses II may snicker with his adopted brother and best friend Moses about the superstition of the old Pharaoh, but deep down, he knows there is something ominous in the prophecy. Seti I knows, too, which is why he gives both Rameses II and Moses a sword each, with the other's name written on it - this way, they will never raise it against each other. Moses ends up saving Rameses II's life, and history is changed irrevocably. On a visit to Phitom, Moses meets with Nun (Ben Kingsley), and Joshua (Aaron Paul), both Jews, and therefore slaves. Nun tries to tell Moses about his birth, but the latter refuses to listen. When Rameses II becomes the next Pharaoh, he is told about Moses' origins. In the process, Moses is imprisoned and exiled. He almost dies while roaming the desert, but fortunately, he comes across a desert shepherd tribe. They offer him a place to stay for the night, but he ends up living there for over nine years, marrying the chief shepherd's daughter, Zipporah (Maria Valverde). And then he receives a message from the power above. He needs to save his people. Moses goes back to Phitom, gathers the Jew slaves together, trains them in the art of warfare, and then demands, from Rameses II, either equality as citizens or total freedom for the Jews. When Rameses II refuses and retaliates with violence, Moses brings upon the Egyptians the wrath of the gods - from man-eating crocodiles in the Nile to an attack of locusts. Ridley Scott jumps straight into the story of Moses, the Egyptian Prince, at a time when he is invaluable to the Pharaoh. He skips the part that we have come to expect from every retelling - the baby in a basket set afloat in the river, hidden by the reeds. He also skips the palace romance between Moses and Nefretiri, and the literal parting of the Red Sea - the latter is done differently than you expect. Rameses II and Moses are very close, but that relationship is never really shown after the first few minutes. Therefore, the antagonism between the two does not have the required effect later. It is inevitable, but The Ten Commandments is a point of reference for all things Moses, at least in films. In that epic movie, Moses is oblivious to his calling, until he meets with his birth mother, and later, his elder brother Aaron and the stonecutter Joshua. All this is glossed over (in fact, there is no mention of the mother) in Exodus: Gods and Kings. Here, Moses slips into his role as leader of the Jews without too much trouble. The personal trauma of having to destroy the man he loves, the difficulties of leading a debauched, defiant tribe of slaves - all of these are not dealt with. Not that there is much that is inaccurate, or untrue to the book and the earlier movie. Which basically means that the script is a bit erratic in its narration. The high points - the revelation, the suffering, and the acquisition of the tablets - are not given their due. It is still an interesting story, but if you do not know your Bible, then you may wonder why it is that Moses is such a big deal. The story seems incomplete and makes you want to run home and watch the 1956 movie, or at least the animated Prince of Egypt (1998). Christian Bale is indifferent as Moses. He scowls a lot, and has the right expressions to portray his confusion and dilemma, but the screenplay does not do him justice. True to his comment, he does come across as an arrogant, stubborn man. Joel Edgerton, on the other hand, makes a suitably pompous Pharaoh. He is egoistic and vulnerable, and you cannot help but feel sympathy for him. The only other actor given her due is Maria Valverde. Ben Kingsley, Aaron Paul and Sigourney Weaver are all disappointingly wasted in this film. 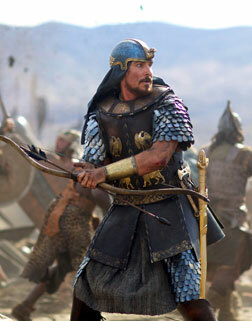 Exodus: Gods and Kings is all about visuals, if you have not already watched the trailer. The CG and VFX are, needless to say, world-class. The production design is grand, and has all the right colours, without going overboard. Ditto for the costumes. This movie is likely to become, in the future, the most reliable authority on the clothes and architecture of the period. The aesthetics of the visuals will make you sigh, and the music hits all the right notes for you to appreciate the grandeur. The editing could have done away with certain repetitive sequences, but then again, you would have been deprived of those wonderful visuals. The 3D makes the camera work seem almost surreal, especially since many of those wide, panoramic shots are taken from the ground level. You are made chillingly aware of how small man is, really, when the top and low angles show you the human beings next to those grand Egyptian structures, or when the waters of the Red Sea come swirling down on those formidable men in chariots. Our take? If you want to know the story, watch any of the two movies (1956 and 1998) mentioned above. If however, you want to experience the wars, the waters, the violence, the despair and the redemption, then Exodus: Gods and Kings is your best bet. This movie cannot be missed, but you have to overlook the sketchy script to appreciate it for what it is - a visual wonder that Ridley Scott made as a tribute to his late brother, Tony Scott. 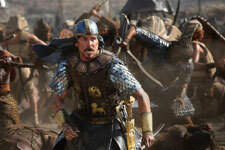 Be the first to comment on Exodus: Gods And Kings (3D)! Just use the simple form below. fullhyd.com has 700,000+ monthly visits. Tell Hyderabad what you feel about Exodus: Gods And Kings (3D)!